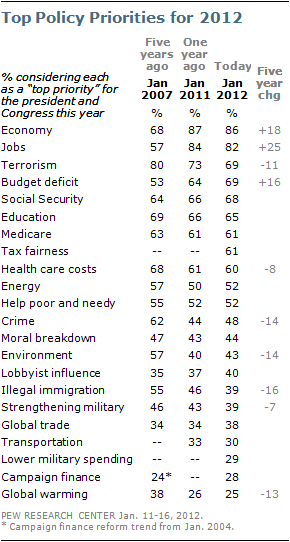 As the 2012 State of the Union approaches, the public continues to give the highest priority to economic issues. Fully 86% say that strengthening the economy should be a top priority for the president and Congress this year, and 82% rate improving the job situation as a top priority. None of the other 20 issues tested in this annual survey rate as a top priority for more than 70% of Americans. 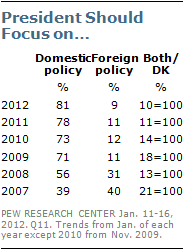 More generally, the public’s concerns rest more with domestic policy than at any point in the past 15 years; 81% say Obama should be focused on domestic policy, just 9% say foreign policy. In keeping with this, defending against terrorism and strengthening the military are given less priority today than over the course of the past decade. Nonetheless, the public is keeping a wary eye on Iran. It is now seen as the country that represents the greatest danger to the U.S., and more Americans prioritize taking a firm stand against Iran over avoiding military conflict. And with respect to restructuring America’s national security policy, the public is evenly divided as to whether a smaller military can be just as effective as a larger one in facing future security challenges. The new poll finds that the federal budget deficit stands out as the fastest growing policy priority for Americans, largely because of growing Republican concerns about the issue. In the national survey, conducted Jan. 11-16 among 1,502 adults, 69% rate reducing the budget deficit as a top priority – the most in any of the Pew Research Center’s annual policy priority updates going back to 1994. The number of Republicans rating the budget deficit as a top priority has spiked to 84% from 68% a year ago and just 42% five years ago. Meanwhile Republicans are placing far less emphasis on terrorism, which was their top priority in every year between 2002 and 2008. Today 72% rate it as a top priority, down from 83% a year ago and 93% five years ago. 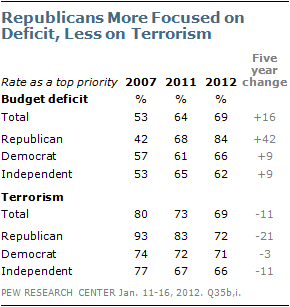 By contrast, the emphasis Democrats and independents give to terrorism and the budget deficit has changed far less. Making the Social Security and Medicare systems financially sound continue to be top-tier issues for Americans, with 68% and 61% rating them as top priorities, respectively. 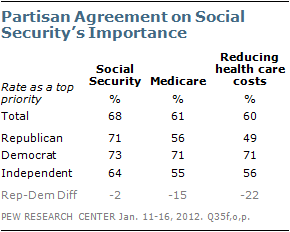 There is a substantially larger partisan divide over Medicare, which Democrats view as higher priority than do Republicans, than over Social Security. Reducing health care costs remains one of the more divisive issues politically, as it was even before the recent battle over health care reform. Currently, 71% of Democrats rate it as a top priority, compared with just 49% of Republicans. No issue divides partisans more than the importance of environmental protection – 58% of Democrats say it is a top priority, compared with just 27% of Republicans. Of the 22 items tested, environmental protection is one of the lowest GOP priorities, along with such issues as improving transportation infrastructure and campaign finance reform. Dealing with the nation’s energy problems, by contrast, is of equal importance to both Republicans (55% top priority) and Democrats (57%), though other recent surveys suggest that partisans have very different solutions in mind. 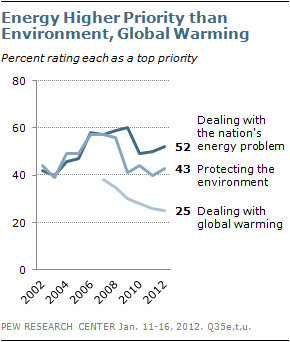 Since it was first tested on the annual policy priorities list in 2007, the share of Americans who view dealing with global warming as a top priority has slipped from 38% to 25%. Democrats (38%) are far more likely than Republicans (11%) to rate this as a top priority. But the decline has occurred across party lines: In 2007, 48% of Democrats rated dealing with global warming as a top priority, as did 23% of Republicans. Despite a recent focus on the issue of money in politics, including the role of Super PACs in the 2012 Republican primaries, the issue remains on the back burner for most Americans. Just 28% say reforming the campaign finance system is a top priority for the president and Congress in 2012, and it is one of the lowest ranked issues across party lines. Somewhat more (40%) say reducing the influence of lobbyists and special interest groups in Washington is a top priority. There has been little change in the public’s focus on either issue compared with previous years. The share of Americans ranking illegal immigration as a top priority has fallen to 39% from 46% a year ago and 55% in 2007. This decline has occurred across party lines, with a notable drop among Republicans. In 2007, illegal immigration was the second-highest priority after terrorism for Republicans, with 69% rating it as a top priority. 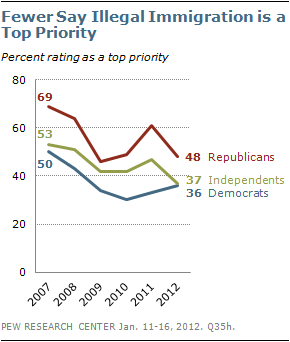 Today, 48% of Republicans rate it as a top priority, placing it behind 11 other priorities. 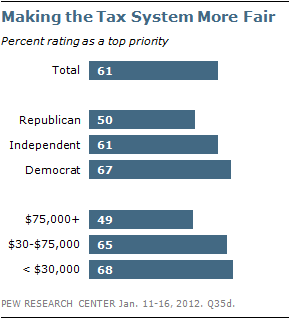 About six-in-ten Americans (61%) say that making the tax system more fair should be a top priority for the president and Congress this year. It ranks among the top 10 issue priorities, well above items like immigration or the environment, and nearly on par with perennially top-tier issues like education (65% top priority). Democrats and independents rate this as a more critical issue than do Republicans, but half of Republicans say this should be a top priority in 2012. About two-thirds of Americans with household incomes under $75,000 rate this as a top priority, compared with about half of those earning $75,000 or more. The recent tensions over Iran’s nuclear program and disputes between the U.S. and Iran in the Persian Gulf have garnered a good deal of public attention. Roughly four-in-ten (42%) say they have heard a lot about this, and 41% have heard a little. 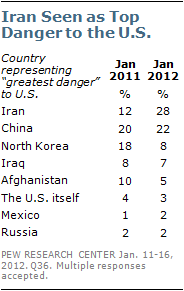 The percentage naming Iran as the country posing the greatest danger to the U.S. has more than doubled to 28% from 12% a year ago, and it now ranks slightly higher than China. Of those following the Iran situation, 54% say the U.S. should take a firm stand against Iran’s actions, while 39% say it is more important to avoid a military conflict with Iran. On Afghanistan, the public favors removing U.S. troops as soon as possible by a wide 56% to 38% margin. Obama continues to receive highly favorable marks for his handling of Afghanistan, and more approve than disapprove of his handling of Iran as well. (For more, see “Obama: Weak Job Ratings, But Positive Personal Image” Jan. 19, 2012). As President Obama prepares for his third State of the Union speech Tuesday evening, 36% say this address will be more important than previous years’ speeches; 14% say it will be less important and 46% say it will be about as important as past State of the Union addresses. This is about the same balance of opinion offered before each of Obama’s previous two addresses. Not surprisingly, far more Democrats (53%) than independents (29%) or Republicans (27%) view Obama’s speech as more important than usual. However, there is considerably more agreement that Obama should focus his energies on domestic issues, rather than foreign policy: Currently, 81% want the president to focus domestically, much more than said this prior to George W. Bush’s last two State of the Unions, in 2007 and 2008.